Kohlrabi is a member of the cabbage family, and as such, comes with this family’s signature sweet-but-peppery flavor profile. 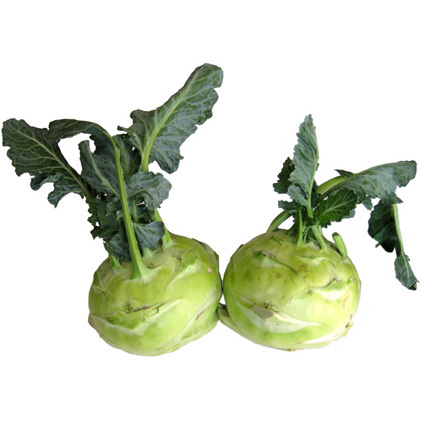 We usually eat the bulbous bottom, but the entire kohlrabi plant is actually edible. The skin has the rubbery texture of broccoli stems and can be white, light green, or bright purple. The insides are usually a creamy white. Steam cauliflower florets and kohlrabi over 2-3″ of water in a basket for 10 minutes or until kohlrabi is very tender. Remove veggies from basket, discard the water and return the veggies back to the hot pot. Add remaining ingredients and mash really well. I added a splash of vegetable broth to thin it out.